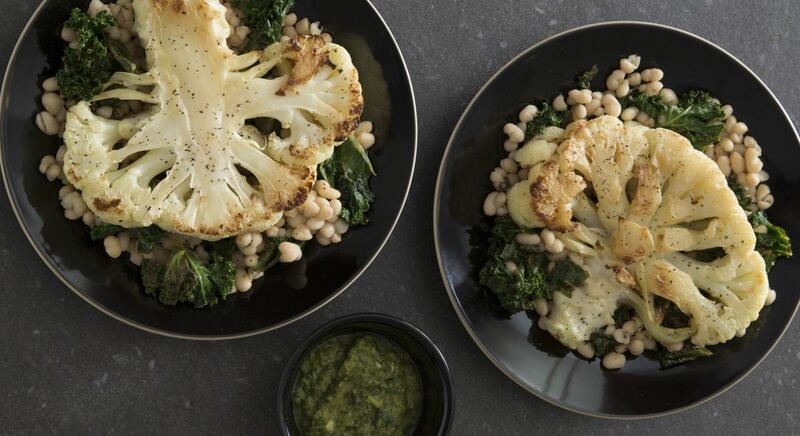 Cauliflower, like eggplant, offers a satisfyingly meaty texture when cooked and absorbs flavors wonderfully. A zesty salsa packed with fresh herbs makes the ideal accompaniment, plus white beans for extra protein. Make the salsa verde first. Peel the garlic and finely chop the herbs on a large board along with the capers, gherkins and anchovies. Place in a bowl, add the mustard and vinegar, then slowly stir in the oil until you achieve the desired consistency. Season and add additional vinegar or oil to taste. (Make ahead of time and store in a sterilized jar for up to a month, if desired). Add the garlic and 1 tablespoon of olive oil to a deep heavy-based pan and cook on low, stirring constantly, for 2 minutes. Add the lemon zest, water and cavolo nero. Toss to combine. Cover and cook, stirring occasionally, until the greens are tender. Season with salt and pepper. Mix in the beans and lemon juice. Cut the cauliflower from top to bottom into four ½-inch-thick steaks. Season on both sides. In a large skillet, heat the remaining oil. Add the cauliflower in a single layer. Cook over high heat for 2 to 3 minutes, until well browned. Carefully turn and fry for another minute. Pour over the stock. Simmer until the stock has evaporated and the cauliflower is tender (easily pierced with a knife). If doing in batches, keep the first set warm in a low oven. Transfer the cauliflower to a platter. Spoon over the salsa verde and sprinkle with toasted pine nuts.